The best almond chicken recipe ever! 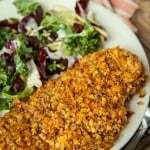 Almond crusted chicken that's crunchy on the outside and moist on the inside! Delicious enough that both kids and adults will love it! Combine the first six ingredients (through the salt) in a food processor. Pulse until the almonds are chopped fairly small. Pour the almond mixture in a shallow bowl. Pour the beaten egg egg in a shallow bowl. Salt the front and back of each piece of chicken. Working with one piece at a time, dip the chicken in the egg and then coat with the almond mixture making sure to pat the mixture into the chicken. Place the chicken on a non-stick baking sheet or one lined with parchment paper. Drizzle olive oil over top of chicken to help make crispy. Bake for 22-25 minutes and remove from oven. This is the gluten-free version. If you would like to make this a breaded almond chicken, you can substitute 1/4 cup of the almonds with bread crumbs to add a little extra breading to the chicken.